Toyota has updated the Prius with the option of intelligent all-wheel drive (AWD-i) for the first time as part of a raft of updates for 2019. The technology uses an additional, independent rear electric motor to automatically provide rear-wheel drive when pulling away at speeds of up to 6mph, or when low-grip conditions are detected at speeds between 6 and 44mph. Operation is automatic and on-demand. The system has been engineered specifically for Prius and is said to bring minimal impact on the car’s fuel efficiency and low emissions. NEDC Correlated CO2 is from 85g/km with WLTP combined cycle fuel consumption from 58.7 to 64.7mpg. This compares to 75-84g/km and 59.6-68.4mpg for the front-wheel drive Prius. It’s also been designed for minimal impact on load space, which reduces by 45 litres while retaining a flat floor. 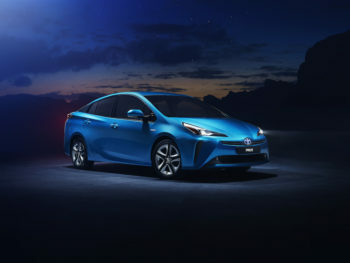 The updates also see the Prius get fresh styling elements, new interior trims and enhanced equipment features, including a larger wireless charging tray, more intuitive and faster operation of the Toyota Touch 2 multimedia system and added functionality for the head-up display. In addition, the new Prius follows the new Toyota RAV4 in adopting the second generation of Toyota Safety Sense, benefiting from new and improved functions. The package includes Pre-Collision System, Intelligent Adaptive Cruise Control, Lane Departure Alert/Lane Trace Assist, Automatic High Beam and Road Sign Assist. The new Prius with AWD-i will initially be launched in selected Western European markets, including the UK, from the spring. The roll-out will extend to other Central and Eastern European markets in the future. Details of prices, range and specifications will be announced nearer to the on-sale date.